Hello my lovelies! After a fun weekend, it's Monday again. I can't say that I was very happy when I woke up this morning but the day went pretty well so I can't complain. There's also a manicure that I want to show you and that I'm very excited about. The inspiration came from a pretty unusual place, namely my bikini. I've had this bikini for a couple of years but didn't realize that the top was a perfect nail art inspiration until now. I'm very happy with how these nails came out. As a base I used one of my new Color Club polishes, namely Look, Don't Tusk. It's an off white creme with a very light hint of yellow in it. I got this polish to use as a base for nail art, especially because I read that it had a good formula. It does need a couple of coats to be opaque but I'm pretty satisfied with it. It's not chalky and it's easy to apply. Here's how it looks by itself. 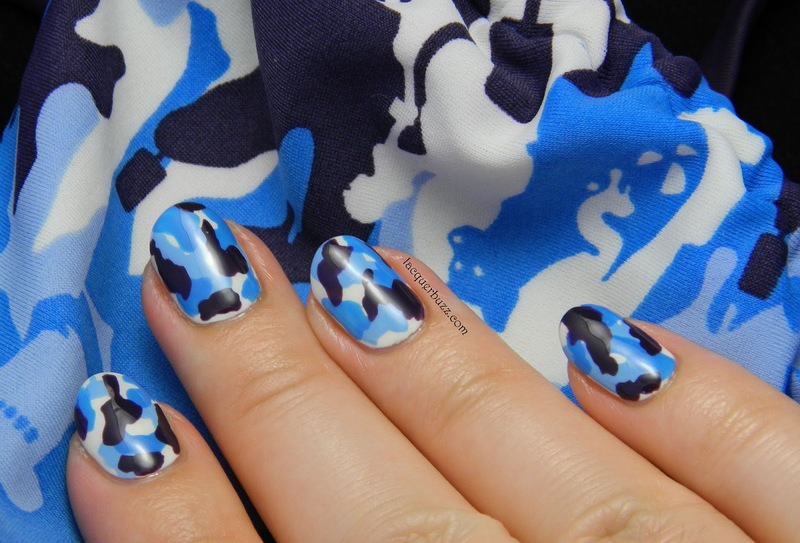 I used a few different polishes to create the camouflage print over the base color. I tried my best to choose polishes that were close to the original colors on the bikini top. So here's what I used: China Glaze Bahamian Escape (lighter blue), China Glaze Flyin' High (medium blue) and a-england Elaine (purple). All I did was use the polish brushes to freehand the random camo shapes. I think I did a pretty good job even though the result isn't identical. You can see for youself in the photos below. 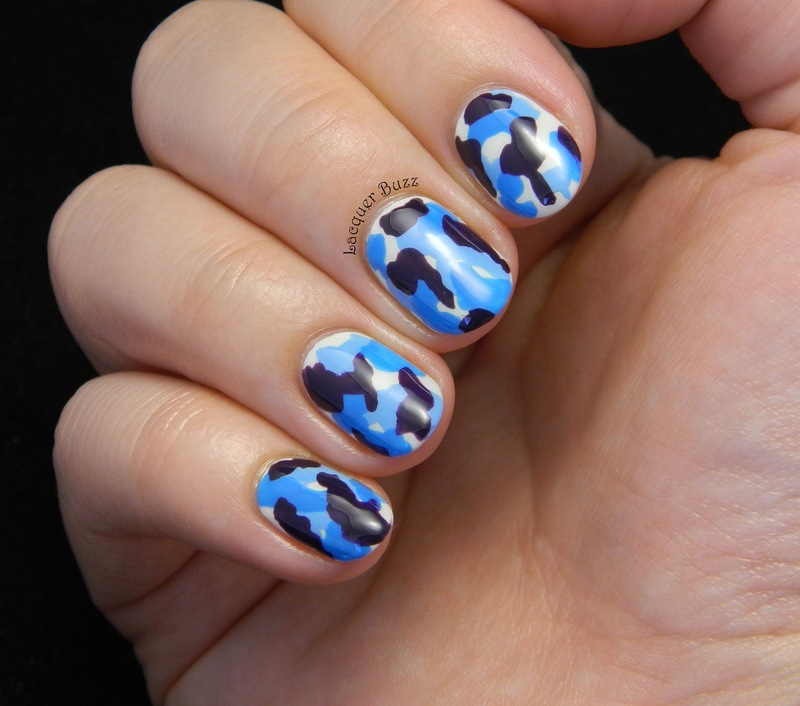 I'm a big fan of the camo print but I haven't done one on my nails for years. Blue camo is even better because it's both colorful and interesting. Please tell me in the comments below what you think about these nails. And don't forget that you can check out more Monday Blues by clicking the links below! Nicely done! I love how this came out! 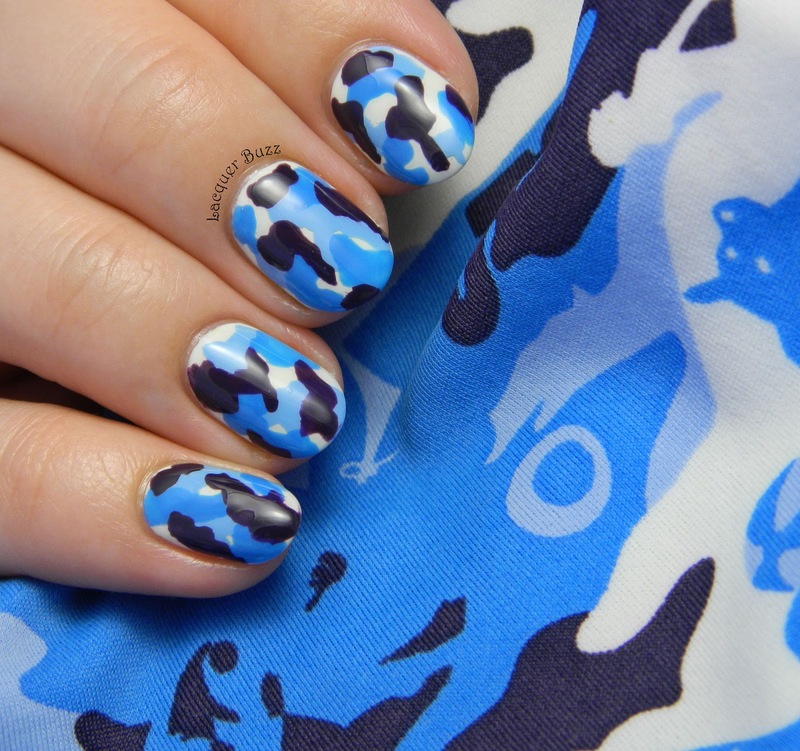 Awesome blue camouflage nails! It looks just like it too!